How to enter loan number, Federal Tax ID, set up automatic late fees, create a line of credit, etc.? 1) How/where do I enter my loan #? Can I change the identifier number automatically assigned by Margill? 2) Most of my clients are businesses, and I do not see a place to enter the Federal Tax ID number. I would also like to add fields for type of company, state of formation, year of formation. 3) When posting payments, most are not made on the exact due date, so I need to right click and post the payment into the schedule, is that correct? Also, where can I enter the type of payment and identifier, like the check number? 5) How to automatically set up Late Fees? You can create as many custom fields as you want. You would create these for the Borrower and others for the Loan – you tie the field to the closest – Borrower or Loan (and even Creditor but you may not need these custom fields). 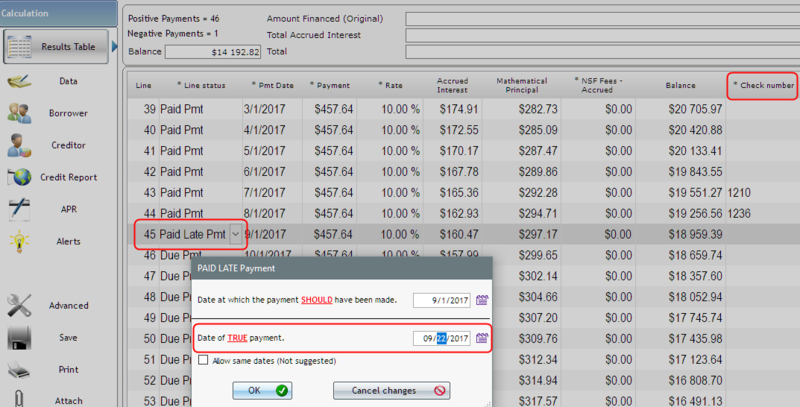 3) When posting payments, most payments are not made on the exact due date, so I need to right click and post the payment into the schedule, is that correct? Also, where can I enter the type of payment and identifier, like check number? You do not need to right click. You change you Line status column from a Due Pmt to a Paid Late Pmt. This small window will then appear to enter the true payment date – in this example Borrower was supposed to pay on the 1st but paid on the 22nd. The date can also be changed directly in the Pmt Date column. If you did not wish to charge extra interest if the payment was only a few days late, you could have entered the true payment date in the “True Pmt Date (Grace/EFT)” column without changing the “Pmt Date.” Transaction reports would pick up this special date. You can also add a Comment to each payment line and multiple other elements that you customize. You would first create a Record type called Line of credit (Tools > Settings). 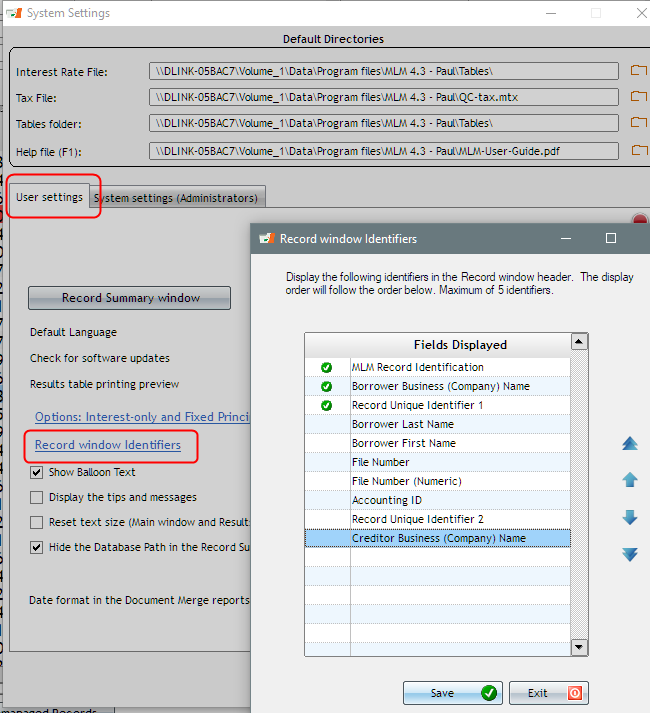 You then create a Record and in the Data tab enter this information. I advanced 50,000 on 9/5/17. Once the payment schedule is calculated (one line schedule at first), you simply add lines at the end depending on whether they are Advances or Payments. Here there was a second $15,000 advance and a $3,000 payment. I also added an Information line in the year 2020 to keep the interest accruing. 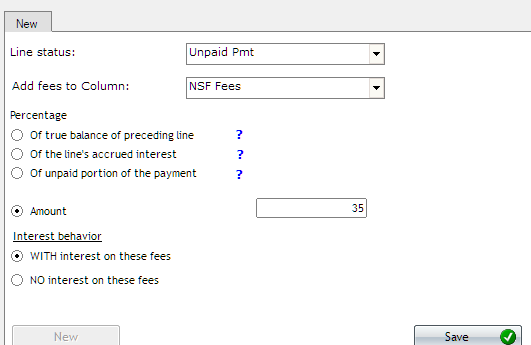 When a payment is made, column fees and then interest are paid first, then principal. In the example above, the $3,000 payment will pay principal. You could have had Margill compute the total interest to be paid (right mouse click). If monthly payments MUST be made by the Borrower to pay interest, then you would have set up a line of credit with Monthly payments (not Irregular) and would have specified that these pay interest. This is a more advanced feature called “Line Behavior.” Let me know if this is what you want, and I can explain this in more detail. You can create one or multiple Automatic fees. Go to Tools > Settings > Column Fees: Automatic. You then select the Line status and create your own rules. You can charge an amount, a percentage of the balance, a percentage of the unpaid portion, etc. https://www.margill.com/wp-content/uploads/2017/02/jur-logo-margill-avec-spacer-top_EN-300x73.png 0 0 Marc Gelinas https://www.margill.com/wp-content/uploads/2017/02/jur-logo-margill-avec-spacer-top_EN-300x73.png Marc Gelinas2017-09-05 15:03:302018-10-05 19:08:49How to enter loan number, Federal Tax ID, set up automatic late fees, create a line of credit, etc. ?